Quick multiple choice: What's a Vesta? a) A low-calorie soft drink. b) A 12th century Scottish garment. c) A truly awful sub-compact Chevy from the early 1970s. d) The coolest little asteroid in the known solar system  one that has just gotten cooler still thanks to some new findings by the Dawn spacecraft, which has been orbiting the ancient space rock since last summer. OK, so maybe we gave the answer away. But that doesn't diminish the richness of the discoveries just published in a series of six papers in the journal Science. And it only raises expectations for what we may expect from Dawn in the years ahead. Vesta is the second largest object in the asteroid belt, measuring 360 miles (578 km) across. Only its sister asteroid Ceres, at 606 mi. (909 km) tops it. Both are huge by asteroid standards, but undeniably small on the planetary scale; Vesta's modest mass, for example, gives it a gravity that's just 2% that of Earth. Still, as artifacts of the long-ago stages of cosmic history (or what NASA, elegantly describes as "special fossils of the early solar system"), they have always been very tempting targets, and in 2007, NASA launched Dawn  an innovative, ion-propulsion spacecraft  to reconnoiter them both. Since July 16, 2011, the ship has been orbiting Vesta, at altitudes as low as 125 mi. (200 km), scanning the surface with a gamma ray and neutron detector, as well with as a visible and infrared mapping spectrometer and capturing more than 20,000 images in the process. Perhaps the most striking of the new findings is how much like a planet Vesta actually is. The asteroid has taken a severe pounding by other, smaller asteroids in its 4.5 billion year history, producing lots of bits of rubble  known as Vestoids  some of which have fallen to Earth in the form of meteorites. Specimens thought to come from Vesta always intrigued geologists because of their unusually low iron content. This suggested not that Vesta's iron was missing, but that it had been sequestered in its core during an early, molten stage, in much the way Earth and other larger worlds became layered as they formed and cooled. Analyses of Dawn's orbit around Vesta confirm that this is indeed the case, with the asteroid's gravity and density pointing to a core measuring about 68 mi. (110 km) across, or 19% of its overall diameter. "Vesta looks like a little planet," says geophysicist Christopher Russell of UCLA, the Dawn mission's principal investigator. Like a planet too, Vesta once had volcanoes  though not for very long. Its subsurface magma ocean would have made volcanic turbulence inevitable, but the lack of any plains or other smooth surface features today suggests that the lava stopped flowing and the volcanic engine shut down barely 100 million years into the asteroid's history. "The biggest surprise for me was the absence of any evidence of volcanic features," says volcanologist and Dawn mission scientist David Williams. "Vesta's surface has been so heavily modified by impact cratering that any evidence of its early volcanic activity has been destroyed." But in many ways that makes Vesta more topographically interesting, with cliffs, hills, ridges, troughs and a massive mountain more than twice the height of Mt. Everest rising in its Rheasilvia Basin. That basin measures about 500 mi. (310) km across and was first spotted by the Hubble Space Telescope. Rheasilvia sits inside the even bigger Venenia basin, and spectrometry analyses now reveal that that larger trough was blasted out roughly two billion years ago and Rheasilvia was formed by a second impact about a billion years later. "Seeing two [impacts] was a real discovery and getting their ages is even better," says Russell. Perhaps most surprising to the Dawn scientists was the innate loveliness of Vesta itself. Microscopic cross-sections of Vestan meteorites had already shown them to have a jewel-like interior, but that's true of most geologic specimens when you look at them closely enough. Vesta's landscape, however, turned out to have its own beauty, even if it's one painted in a palette of grays and whites and blacks. "We knew Vesta's surface had some variation in color," says Russell, "but we did not expect the diversity that we see or the clarity of the colors and textures, or their distinct boundaries." It's a measure of what a success the Dawn mission has been so far that the principal investigators can allow themselves to thrill in the simple aesthetics of Vesta. They will get two more months of lingering looks before Dawn fires up its ion engine and shoves off for Ceres, which it will reach in February of 2015 and study for five months. Asteroids may never seem as newsworthy as full-blown planets, but you can't understand the modern solar system without understanding the ancient one. 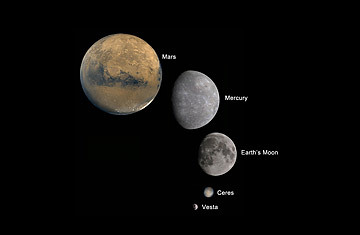 Vesta and Ceres may be two of the richest textbooks of all.